Above are the results of the J.D. 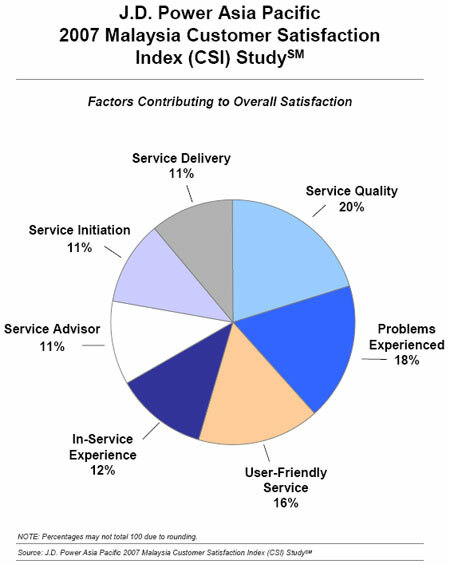 Power Asia Pacific 2007 Malaysia Customer Satisfaction Index (CSI) StudySM published by J.D. Power Asia Pacific. Congratulations for Edaran Tan Chong Motor for topping the list with a whopping 756 points on a 1,000 point scale, with notable performance in the areas of service quality, service advisor, service initiation, user-friendly service and service delivery factors. In second place is Honda, and for national makes, Perodua is the only national brand to perform above the industry average of 728 with an index score of 735. Proton is second from the bottom on the list at 713 points, however it is still an improvement over the last year as they are up 36 points from the previous results – one of the greatest improvements in the industry together with Korean brand Kia. On the overall, satisfaction throughout the industry has improved with the industry average going up 19 points compared to last year. 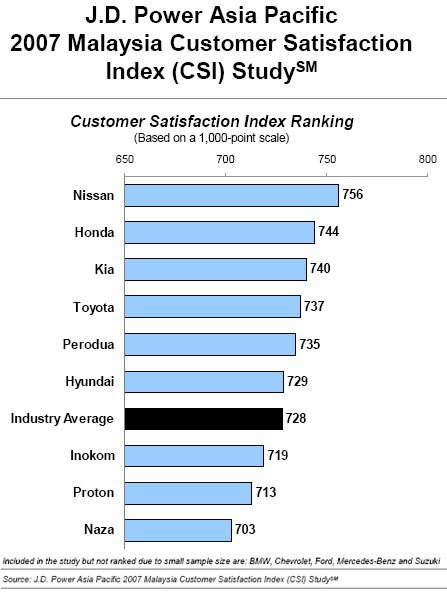 The 2007 Malaysia Customer Satisfaction Index Study is based on evaluations gathered between February and May 2007 from more than 3,000 new-vehicle owners at 12 to 18 months of ownership, and includes those who purchased their vehicles between August 2005 and May 2006. You will find a pie chart with the factors contributing to overall satisfaction after the jump. Next Post: Civic Type R and Civic Hybrid tomorrow?